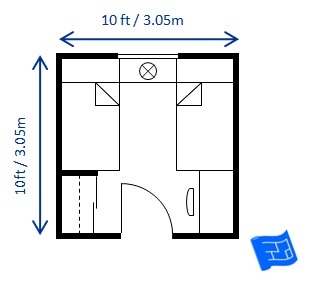 On this page you'll find bedroom size info showing bedroom dimensions and bedroom layouts for each bed size. This information is part of the bedroom design series. The measurements on this table are based on the bed sizes and clearance around the bed recommendations which include minimum clearances and more comfortable clearances. 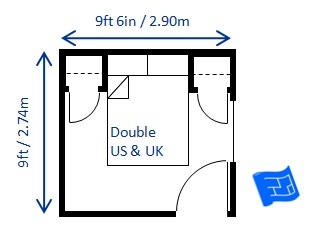 The minimum bedroom sizes are based the minimum clearance, plus a wardrobe and desk or dressing table and/or bedside locker. The standard bedroom sizes are based on the more comfortable clearance, plus some furniture. As the size increases, there is room for more wardrobes and a desk or dressing table - making a good bedroom size. 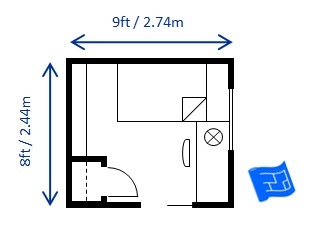 I'll start by saying that most building codes (and as it happens, the UK housing act) require a minimum floor area of 70 square foot (eg 7 x 10ft bedroom) with a ceiling height of 7ft 6ins of ceiling height for a room to be 'habitable'. 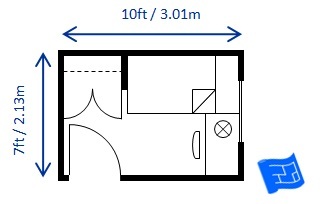 This matters because a single bedroom could fit into a space smaller than this (imagine a cozy bedroom for a toddler using a small attic room) but it won't meet this requirement and you won't be able to list it as a bedroom on a real estate listing. Here's a single bedroom layout built to the minimum bedroom size code requirements (standard bedroom size for a twin/single bed I guess). 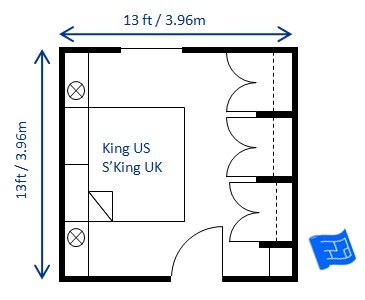 You can see some more single bedroom layouts on the kids bedroom design page. Here's two 8 x 9ft (2.44 x 2.74m) which fulfill the 70 square foot code requirement. The layout doesn't work nearly as well as with a 7 x 10 ft design though. It's not as efficient. The space left over at the end of the bed is an awkward space to fill - there's only room for some shallow storage with 2ft of circulation at the end of the bed. Using a pocket door means that there's no door swing into the wardrobe door or the desk chair. 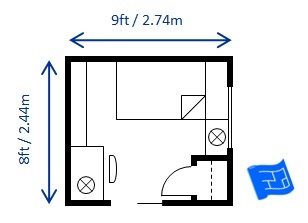 If you're going to go smaller - just be aware that it won't be recognized as a bedroom - and make sure there's a planned fire escape route. 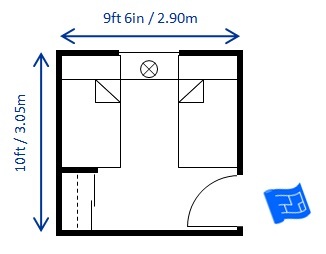 This tiny single bedroom 6ft 6in x 6ft 6in would fit in a single bed, small wardrobe and desk but would be very cramped and would not comply with building code. This room would also benefit from a pocket door. I've seen this arrangement when a closet (with a window) was converted to make a small bedroom when two children were sharing a room - come to think of it the door would have swung out into the bedroom. Here's a couple more single bedrooms which are bigger but still come in under the building code requirement. 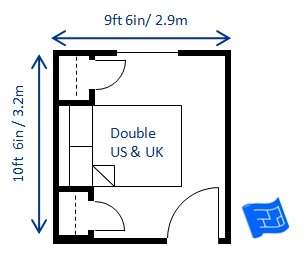 When it comes to twin bedrooms (two single beds) the minimum size is about 9ft x 9ft (2.75 x 2.75m) but this doesn't allow for an awful lot of space in between the beds and any desks or wardrobes are going to be on the small side with less than ideal space for dressing. 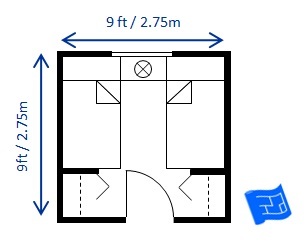 If we move up to 10' x 9'6" (3.05 x 2.9m) or 10ft x 10ft (3.05 x 3.05m) we get a bit more comfort. In the bedroom design above you can see what a difference the door placement makes. There's less room for furniture in this bedroom layout. 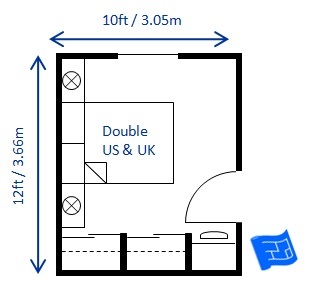 You can see more twin bedroom layouts on the kids bedroom design page. 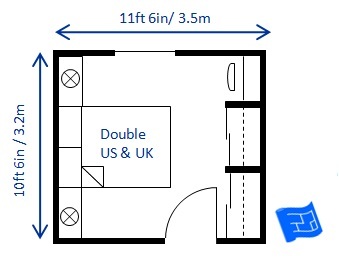 And of course there's bunk beds - see the bedroom sizes for a single twin bed. Just while we're on bunk beds, I've given you the ceiling heights down below and you might also find the built in bunk beds page useful. 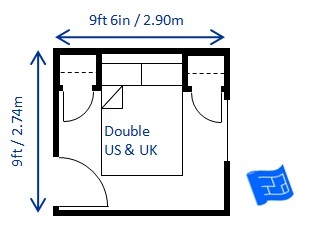 The minimum bedroom size for a double bed is 9ft x 9ft 6in (2.74 x 2.9m). Here's a slightly different arrangement where a deep headboard with a shelf has been added to make up for the absence of bed side locker. 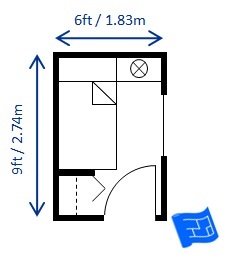 The size of the door has been reduced to 30ins to make this bedroom layout possible. Go up to 10ft 6in x 11ft 6in (3.2 x 3.5m) and we get nice clearance and room to move the wardrobes onto a wall and room for a dressing table. 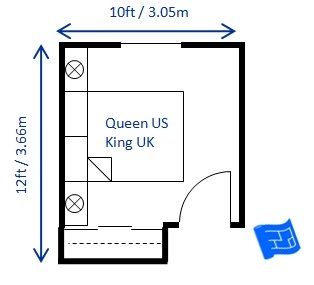 There's only 6 inches in it between a double and a queen (or king UK) bed so take a look at all the bedroom layouts in this section and in the queen (king uk) section. 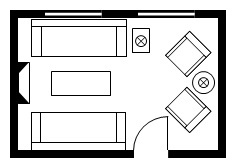 Here's a bedroom design for a double bed 10 x 12ft (3.05 x 3.66m). The bed and side tables could turned through 90 degrees in this room if the window was on one of the other walls. 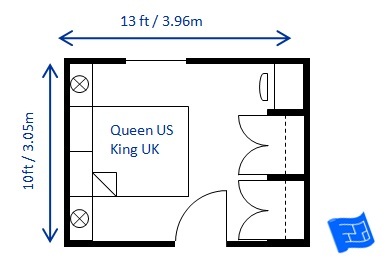 Here's a few bedroom layouts for queen (king in the UK) sized beds. The sliding doors on the wardrobe make it possible to get dressed in this small bedroom design for a queen size bed. Here's the same size again. This is the most efficient positioning of the bed, door and wardrobes to make the most of the space. 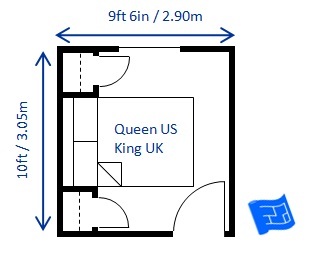 Here's two more bedroom layouts with a bit more of a relaxed fit for queen bed size. These rooms have more room for getting dressed - so you can fit in swing doors on the wardrobes. 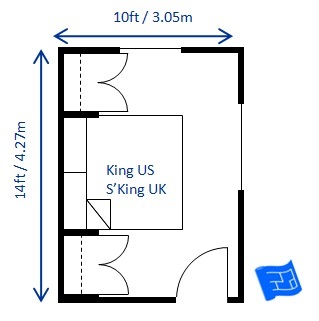 The minimum bedroom size for a king bed (super king UK) is 9ft 6in x 11ft 6in (2.9 x 3.51m). 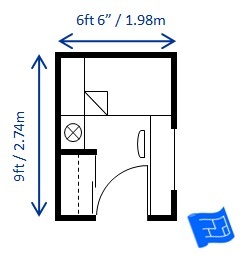 Move up to 12ft x 12ft (3.66 x 3.66m) and you have room for a wall of wardrobes. Sliding doors on the wardrobes are essential to make this scheme workable. There's not an ounce of wasted space. 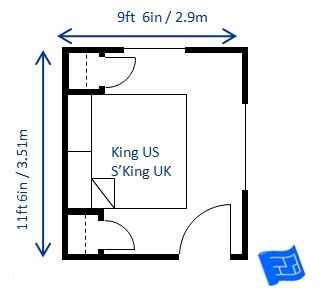 Why not take a look at the Master bedroom design page where you'll find other layouts for king size beds with bathrooms and closets. 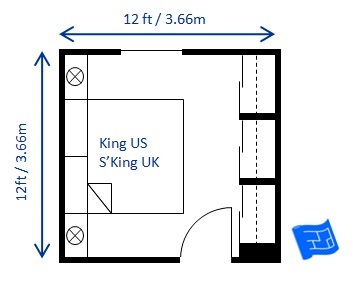 Here's another bedroom size for King size beds (super king UK) - 13 x 12ft (3.96 x 3.66m). 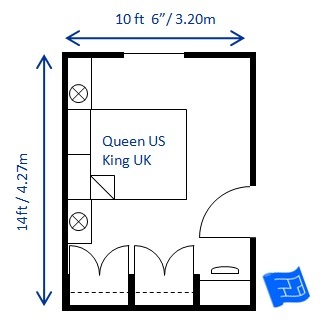 Of course you could substitute a queen, double or single bed into these rooms. 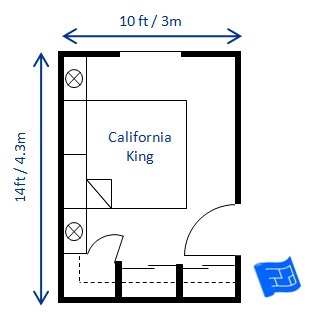 A California King bed would fit - just a bit more snugly length ways into these layouts. If your bedroom is more rectangular shaped, having the wardrobes at the bed head can be a good option. 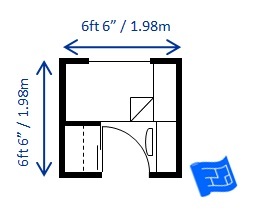 It would be possible to squeeze the bed in with the bed along the 10ft wall but this would leave just under 24 inches of bed circulation space on each side (below recommended amount of 30 inches). You'd get more wardrobe space and maybe space for desk in exchange. 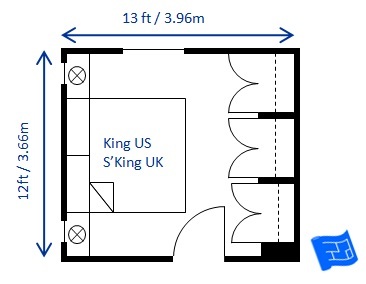 This 13 x 13ft king size bedroom includes space for 'comfort' amounts of circulation space - but there's no excess space. And just for good measure here's a small bedroom design for a California king bed.